Grimme will present for the first time its all-new 6-row integral self-propelled Rexor 620 at the next Agritechnica fair in Hanover. The Grimme Rexor 620 can be equipped, depending on the farmer's choice, with the new FM 300 grinder or the new Inline FT 300 stripper. The tear-off unit is an evolution of the Grimme Oppel wheel system. A very active worm with a wiping unit would allow, unlike conventional systems, a first separation of beets from a large part of their land. The most delicate point for wheeled railcars is the passage of the product under the front axle. By a special design of the chassis, this passage could be increased by 70%. Cleaning is provided by 3 turbines (standard). A cleaning roller unit is available as an option. A large recuperator carpet carries the beets into a 22-ton hopper. The moving floor technology Grimme was chosen. It ensures rapid emptying of the hopper while respecting the product. The Grimme Rexor 620 is equipped with an articulated chassis comprising 2 directional axles allowing a crab walking and a respectful driving towards the left or the right. The internal turning radius is 7.5 m, making the Grimme Rexor 620 the most powerful in its class. The BaSys (Balance System) dynamic system makes it possible to control the slope of the machine both on the road and in the field, especially in the case of extreme slopes. As an option, the Grimme Rexor 620 can be equipped with an approval for road traffic at 40 km / h (according to current regulations). 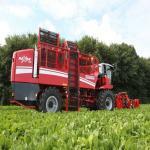 The Grimme Rexor 620, with a power of 490 hp, has the panoramic cabin Claas. It is equipped with 2 Isobus terminals type CCI 200.